Cool Chromes is a recurring feature where we look at slides that have passed through the scanner. There have been a lot of cool diesels throughout the years and a lot of cool paint schemes. I'm too young to have seen the heyday of cab units and most other "first generation" diesel power. The second generation of diesels was well underway by the time I started noticing what was around me. 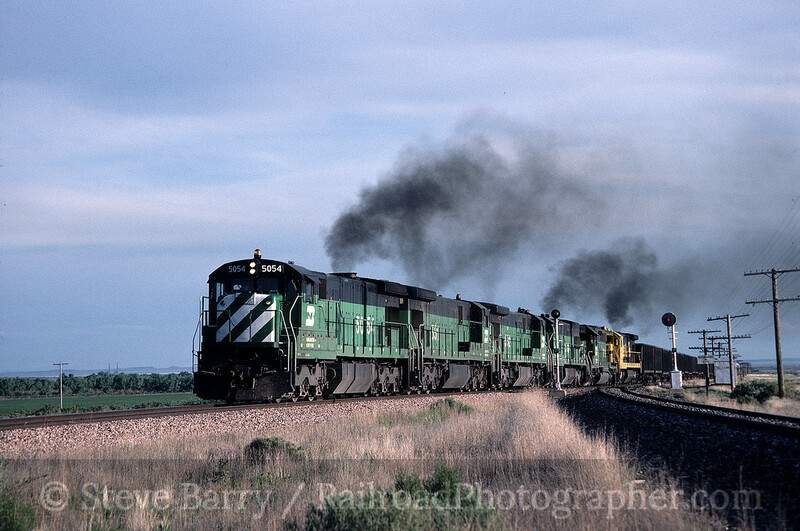 Of the diesels I've seen a lot of, however, there was never a better paint-and-locomotive combination than Burlington Northern's Cascade Green on its General Electric C30-7 diesels. My first encounter with these beasts came in Colorado in 1985. I was making my second trip to the state, and this was the first with my own set of wheels (in 1982 I had been to Colorado as part of the NRHS Convention and didn't venture out on my own). Friend Frank Garon and I had gone to Colorado to ride a fan trip behind Union Pacific's No. 3985, the recently restored Challenger, and as part of the trip had spent a day on the "Joint Line" (Santa Fe and Rio Grande shared the line) between Denver and Pueblo. As the day wound down and we approached Pueblo, we stopped at the railroad junction of Bragdon awaiting sunset. On the horizon I could see a cloud of smoke, and it was moving. 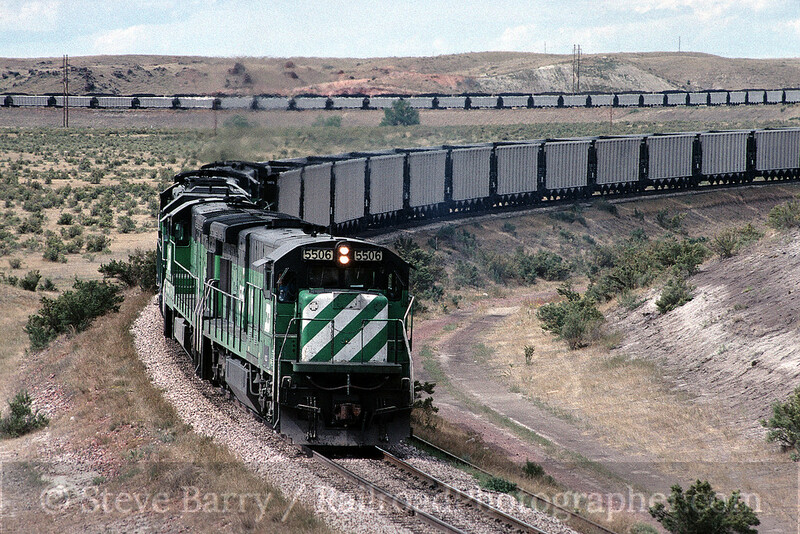 Eventually this cloud of smoke lifted off the horizon with six diesels working hard on the grade out of Pueblo beneath it. Four of the BN C30-7s led the train (trailed by an EMD diesel and a GE from the Santa Fe) and put on quite the show. I was hooked on these engines. Jump forward nine years and I made my first (and so far only) visit to the Powder River Basin, the vast coal region in Wyoming. Both BN and Chicago & North Western (now Union Pacific) served the basin, with brand new GE's holding down duties on the C&NW and mostly SD40-2s from EMD leading BN's trains. A handful of BN's trains, however, had my old friends -- the C30-7s -- leading. These were by far and away my favorite Powder River trains. I don't think any of the C30-7s got painted into the merger colors of BNSF after the BN and Santa Fe merged. I have encountered a few on regional railroads, including in Michigan. But the most recent time I have seen these great engines was in 2005 in the unlikely place of the northern Maine woods. 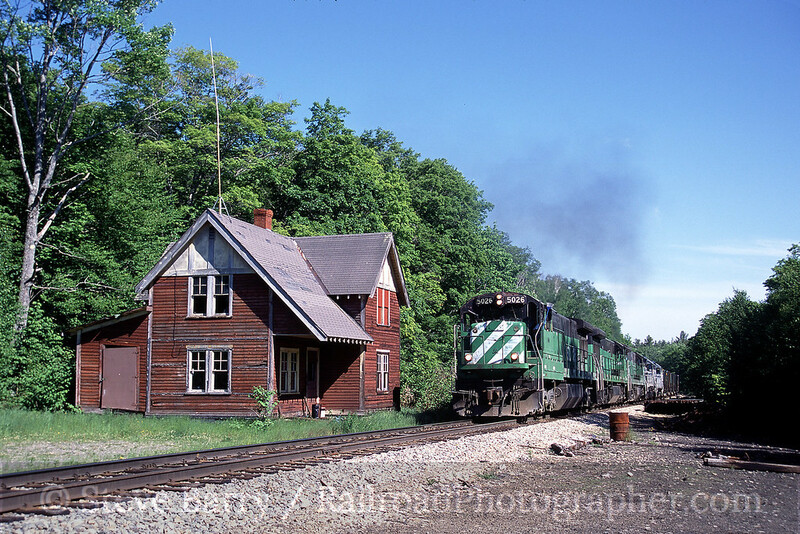 A trio of them -- still in Cascade Green -- were leading a train on the Montreal, Maine & Atlantic past the section house at Bodfish. They still looked and sounded good. Roll on! Great photos! I wish I had your job! In the first photo, isn't the fourth BN GE some sort of U-boat? U33C maybe? It lacks the Dash-7 radiator wings. Cool photos indeed. In the first photo, it appears to be three C30-7's followed by a U-boat. Maybe a U33C? Thanks for sharing!